RETROFEST has got me feelin' GOOD! The sun is SHINING and it is a beautiful day. Why don't we keep the sun shiny feeling going at The Pickle?! Stop in for a free make and take today! 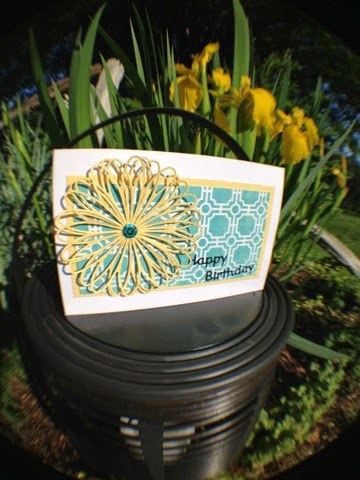 Look how adorable the card looks in my garden! 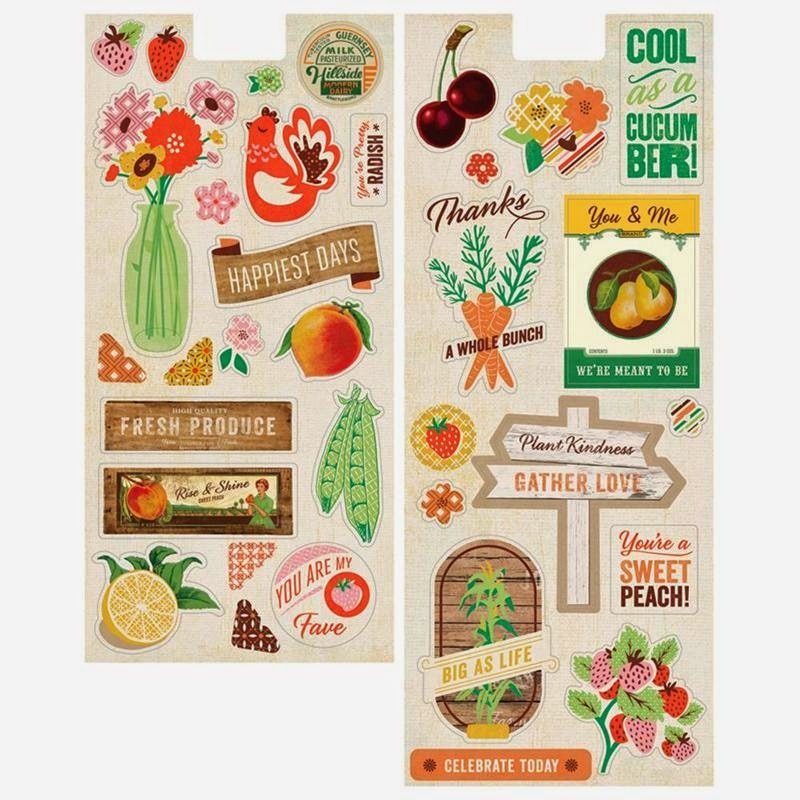 Work with Memory Box dies and see how they can add a simple elegance to any project. What have I said before...they will make you look like a superstar with minimal effort! 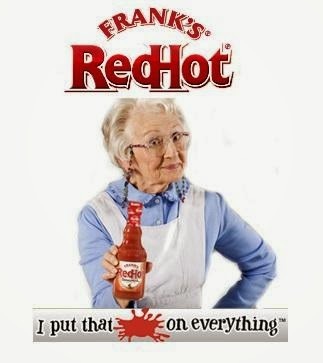 Definitely my kind of product!! 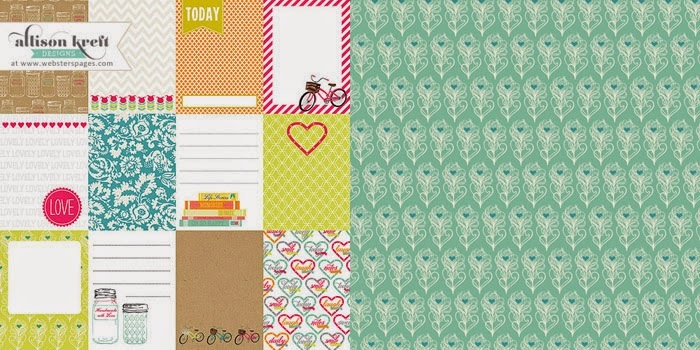 Also, there is still room in the card class with Pauline next Tuesday (June 3). Call and sign up! 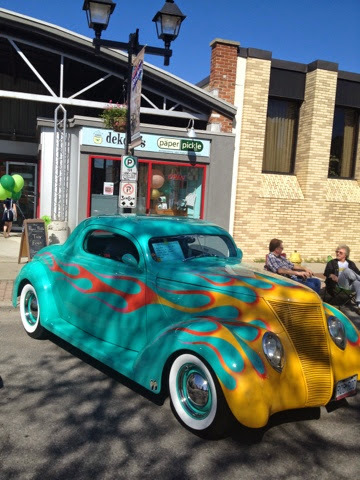 Check out the amazing car in front of The Paper Pickle today!! What?!? 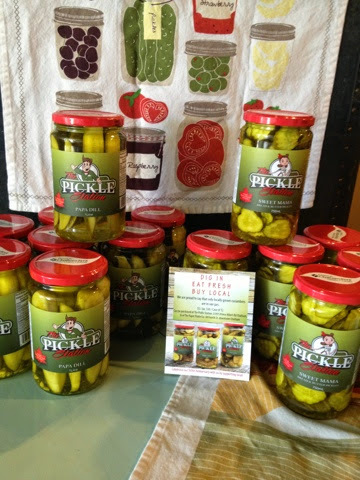 Also sampling The Pickle Station pickles. Say hi to my little helper, Julia! Also last day to shop TAX FREE! Open until 3pm. I walked downtown this morning to do some banking for hubby and to drop off some signage at the store (did you hear it is TAX FREE storewide at The Pickle today and tomorrow? Or mention you follow my blog or facebook page and save 15% on your entire purchase). Well in my travels, I peeked into the storefront windows and I couldn't be more proud of my city and my fellow merchants! Everyone's windows are decorated beautifully for Retrofest. And wow were people moving! Everyone was busy with jobs prepping for this HUGE weekend. So nice to see! Here is a video I came across this morning. It is a very nice summary of what Retrofest is all about. It is a little long but if you are a car enthusiast, you will appreciate the photography and work David Langford put into this video! 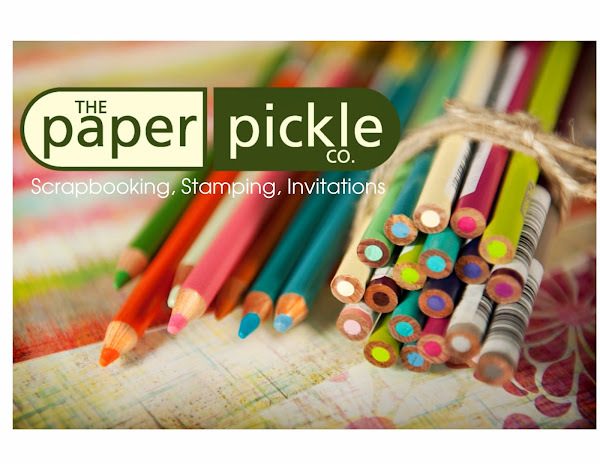 The weather is suppose to be fabulous so come on to Downtown Chatham Saturday and check out Retrofest and maybe even visit The Paper Pickle! This past Wednesday, we had a great card class with Debbie. It was a full house and I think you were all excited that classes are back! Well, I've got another one for ya! 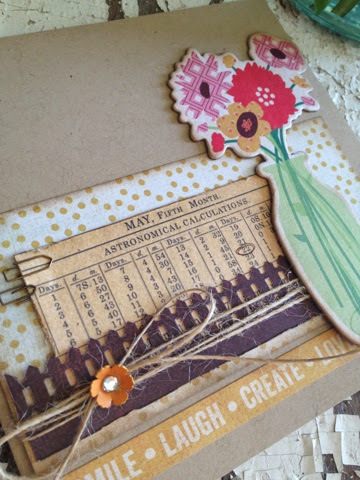 Have a look at the card class Pauline is teaching on Tuesday, June 3rd! You have been asking for this for a while now.....COLOURING CLASSES are BACK! You will be learning colouring techniques from an expert! Work with Copics and pencils on the first card. Various dies will also be used. Honestly, these cards are so beautiful in person! Note: Please note that to get the most out of this colouring class, it is best to have your own supplies. If you require any of the above listed colours, I would be happy to order them for you. Just let me know what you need! Oh. And please bring an Ottlight it you have one! 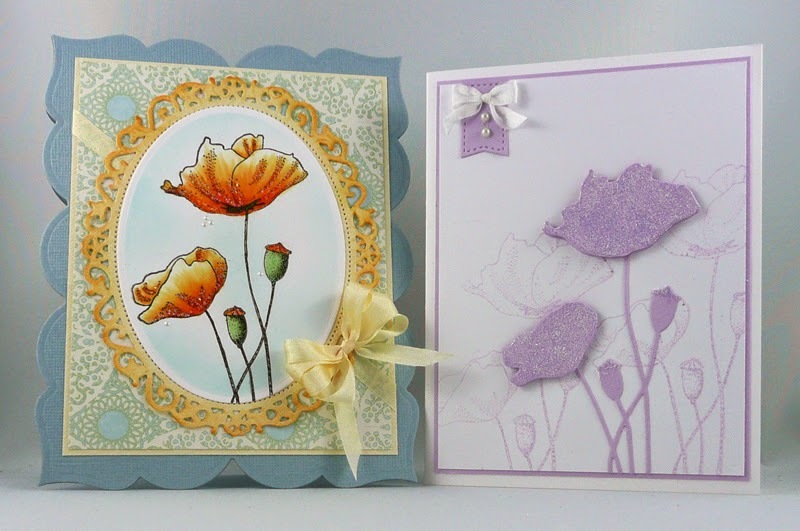 Please call the store (519-351-5220) if you are interested in signing up for this pretty poppy class! I really hope to see you this weekend! Trust me, it is going to be FUN! A very happy birthday to a very special lady! Stop in and wish Debbie a happy, happy birthday! I loved the paper with the calendar on it. Notice I circled Debbie's birthday? 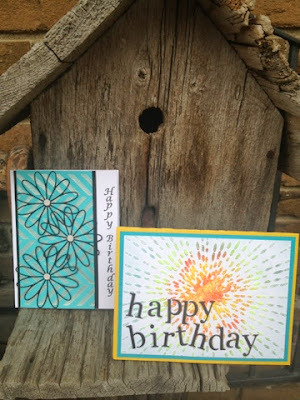 I made Debbie a little card and just HAD to work with Basic Grey's new line called Herb & Honey. 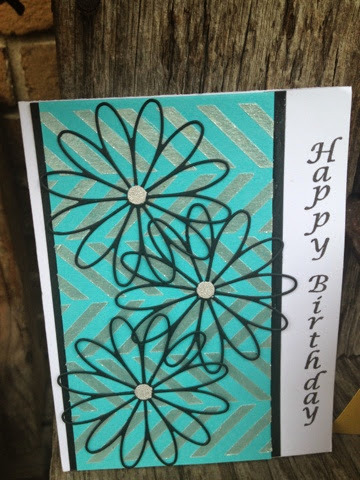 I started with a kraft card stock as the base of the card. 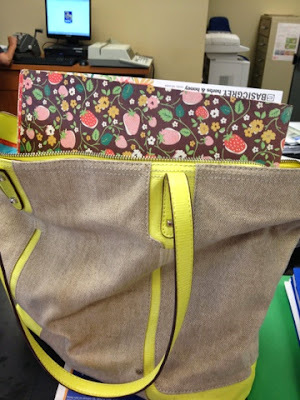 Then I layered in various papers from the line. I was very lucky to have the Martha Stewart fence punch at my house. I say "lucky" because sometimes things are at the store or packed away. I think it was the perfect little addition to this very "country" feeling card. Did you know that %@#$ comes in like 12 different colours? So stop on in and remember to tell Debbie about our little secret. If you tell her you read the blog, you will save 15% off your ENTIRE purchase this week only!! One of my favourite pictures taken from Retrofest 2013. Wonder who I will be kissing this year?! Ha! Good morning! The sun is shining and we are now just days away from my absolute MOST favourite weekend, here in Chatham - RETROFEST! This is the 12th annual and it just keeps getting bigger and better every year. If you have ever thought about visiting Chatham, this is the weekend to do it! 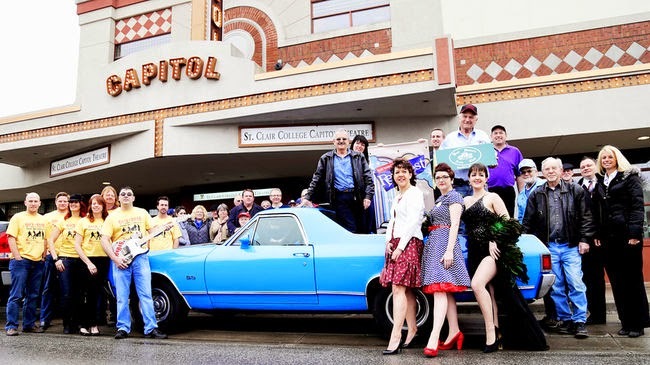 There is a classic car cruise Friday night. Hundreds of cars participate in the Friday night cruise and then the downtown streets are lined with beautiful, classic cars all day Saturday. The downtown merchants have Retrofest specials and there are street merchants. Truly, downtown Chatham is just hopping. Here's an idea, grab your honey. Plan a day trip to Chatham. Let him wonder the streets of Chatham admiring the "muscle cars" and you can wonder into The Pickle and admire the latest and greatest that the paper world has to offer! "Visited your shop last weekend - loved the vibe and the stash you carry. If I could have brought more home on the plane I would have. " Thanks for making my day, Dee! You know what? Let's pass this good mood on to you! I would like to thank those of you who regularly follow my blog or facebook page. You should be rewarded for your loyal support and following! I have a "save the tax" promotion running Friday and Saturday but I would like to extend this offer to you guys starting today! Actually, I can do better than that.....Just tell one of the girls at the store that you read my BLOG post and get 15% off your entire order!! That's an extra savings for following me and The Pickle! Fun cards with AWESOME Technique! Hey guys! Hope you had a wonderful weekend. So we have a great card class coming up ONE WEEK from today! I should have posted last week but my mind has been on other things like cutting the grass and gardening and...! Oh my! The dandelions are taking over right now! 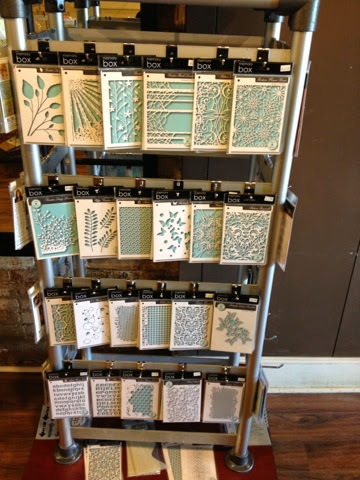 This card class is a MUST if you have been curious about embossing paste. 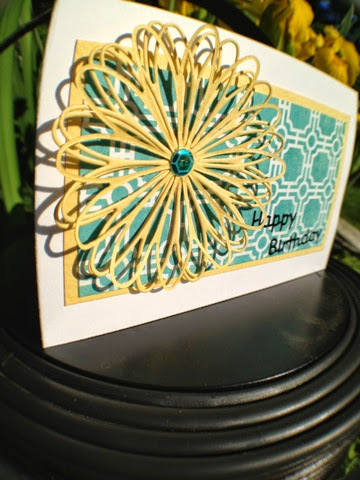 Debbie does an amazing job showing you different ways to use embossing paste to create beautiful cards. 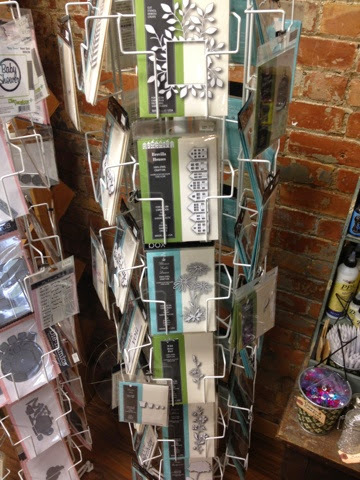 You will also work with Memory Box dies and stamps. Such a fun night out! Please call the store if you are interested in attending! 519-351-5220 So get all your gardening done this long weekend and spend Wednesday evening with us! I hope you come. PS...Look out! I just heard a Memory Box order arrived this morning! The latest shipment has found me falling in love again. Do I fall in and out of love too often with paper lines? What do you think? Honestly, I don't think I ever fall "out of love"....I just keep "falling" more and more...deeper and deeper in love with, well PAPER! Check out my latest fling....Herbs & Honey by Basic Grey. Here is a picture of the adorable display at CHA! Love. Love. Love. 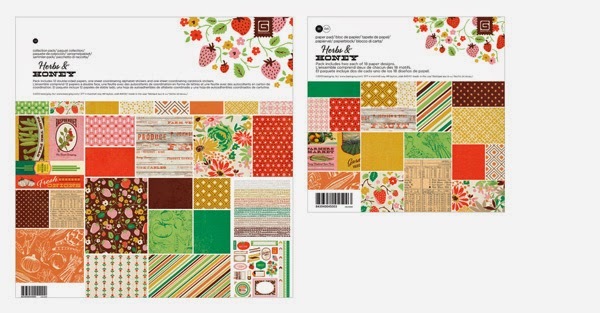 We have 12x12 collection packs and 6x6 pads in store now! Hey. That's some nice chipboard! 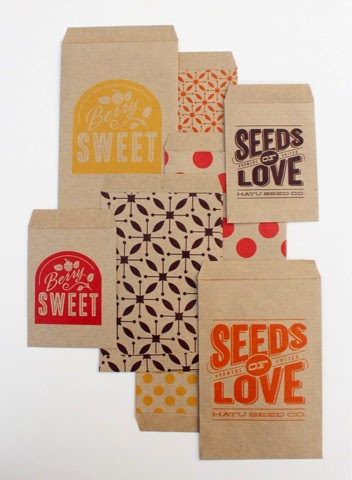 Use these sweet little bags on a layout or fill them with treats for someone special. The colours. The design. What's not to love? This line pulls at my country girl heart strings. I love this line so much it had to make a trip with me to the bank! Look how adorable it looks in my purse! Ha! Paper nerd alert! Got to love phone cameras. They keep me amused. Have a look at some of the other goodies that have arrived. See how nicely they fit into the store? It is not too late to stop in and grab these beautiful goodies for mom. We also have gift cards which are ALWAYS a hit! If you don't believe me, check out what Sharp Designs has to say! If you are not following this blog, you must start! She always has great ideas!! And if you know Marcie's hubby, tell him to get in here and make his wife happy...ha! By no means am I an expert in gift wrapping and gift giving, but I do know that it is the little touches that make the recipient REALLY feel the love. And isn't that the whole point of gift giving? You want to make sure the person you are giving the gift to knows you care. I have blogged about gift wrapping before and with Mother's Day coming up this weekend, this topic is again quite relevant. This was a gift I pulled together for a good friend's birthday. I absolutely LOVE giving themed gifts that are all matchy-matchy. Themed gifts are perfect for those hard-to-buy-for people and even those easy-to-buy-for people. Included in my gift was a cozy throw blanket, citronella patio candle, cocktail mix and cocktail napkins. To me, the most important and KEY part of the gift was the simple little tag. 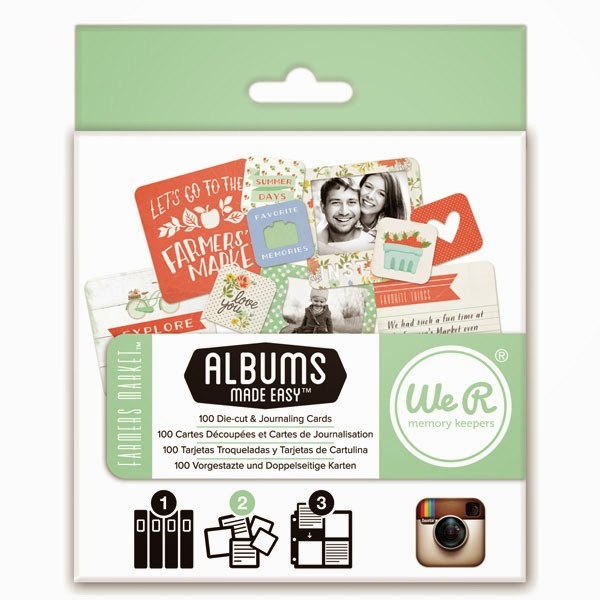 This was actually two cards from the We R Memory Keeper Instagram album themed packs. 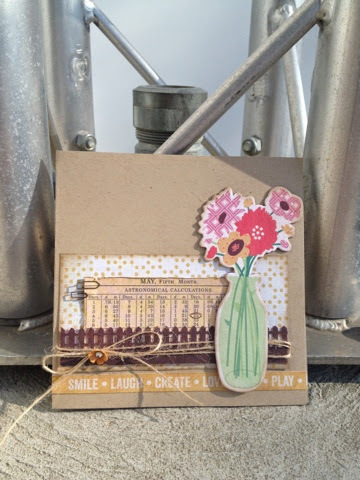 The packs are inexpensive but they have some of THE cutest little pre-designed cards ready to pop into the adorable 4x4 albums or use on their own like I did here! 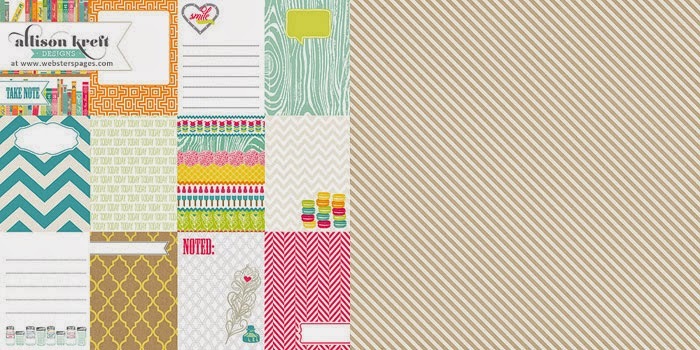 These sheets of designer papers (which are a fabulous weight by the way!) 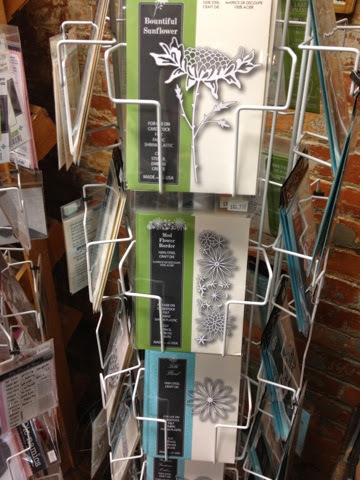 have cards that can be cut out and used on a layout, on a card or on a gift! Round out the corners and your set! It can't get much easier than that! On these cards, you can have fun writing about why you chose the items you did. I wanted my friend to kick back and relax on a summer's night and know that she deserves a quiet moment to herself....and that's for sure with two busy boys! 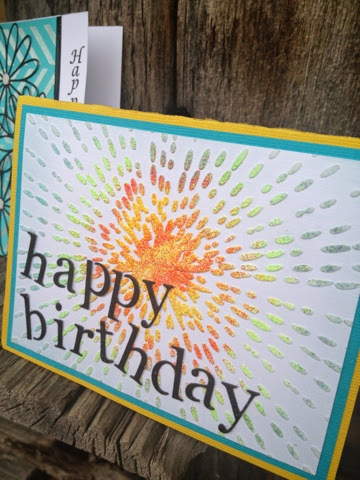 These cards can be dressed up with glitter, ribbon, and more. 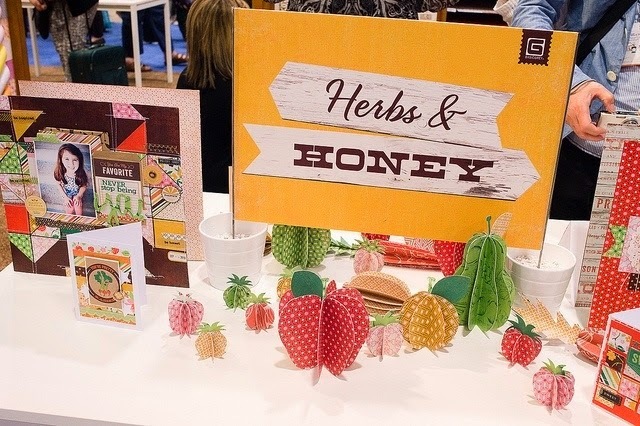 The reason I thought it was so important to blog about this was because I think we all put too much pressure on ourselves to create these masterpiece cards and projects like EVERY TIME! I know more times that not, that I just do not have the time to do that. And rather than NOT doing anything, I would rather do SOMETHING. 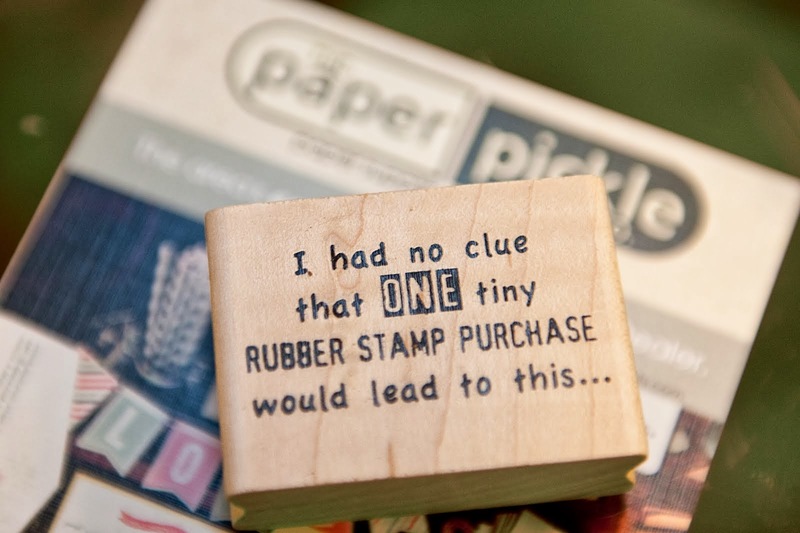 You know, if there was no time to pull out the stamps and the ink and the die and the....I would grab a cute little card like this and write my heart out. It is the thought that goes into gift and the little touches that I think matter. 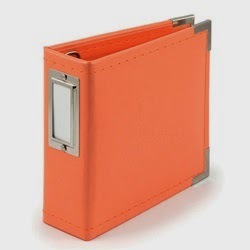 We have TONS of products just like this to make you look like a superstar! Have fun! Create! Think outside the box! Get off the computer and work with those beautiful hands! Enjoy every minute of it! It's all happening! 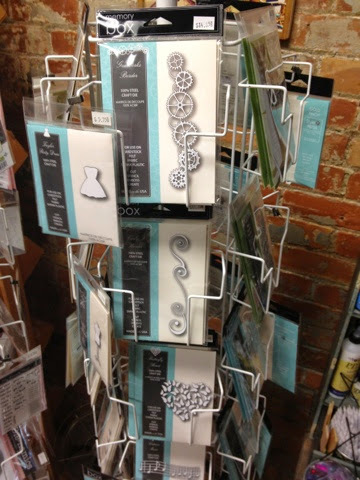 The second shipment of Memory Box dies and stencils has arrived! This is the second shipment from their fabulous NEW release. Honestly, I am not sure how they keep getting better and better with their designs! 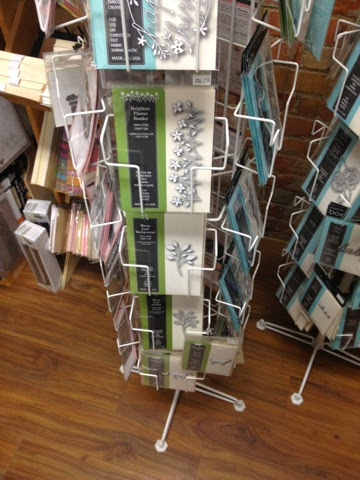 Have a look below of how FULL our racks are! Check out all of the beautiful blooms perfect for spring! I absolutely love the gears die on the top! I may have to use that on my Father's Day card this year! The sunflower die on the top is unreal! Can there be a die more beautiful. 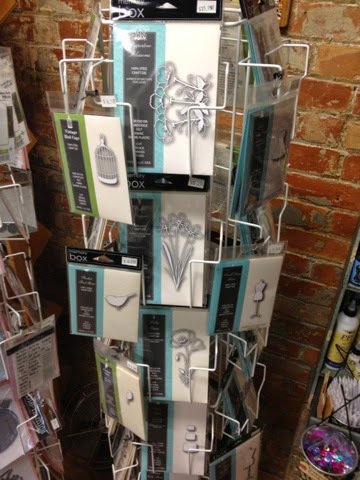 Memory Box stencils are full of elegance and creative possibility.